Everybody knows you need to have zinc or ZDDP in your engine oil to protect your high lift cams, flat tappet cams and high spring pressure valve trains. High performance and aggressive racing engines need quite a lot more zinc than typical modern API rated oils can offer. The question is: is more zinc always better? Many may think so but – as you may have already guessed – too much zinc is also a bad thing. Obviously, there’s a lot of wear when there’s not much ZDDP. As you can see to the left of the chart, no zinc equals no anti-wear protection and lots of abrasive and adhesive wear occurs. Abrasive wear comes from metal on metal contact because there’s no ZDDP film to protect it. Those wear particles then travel through the engine and cause more wear. 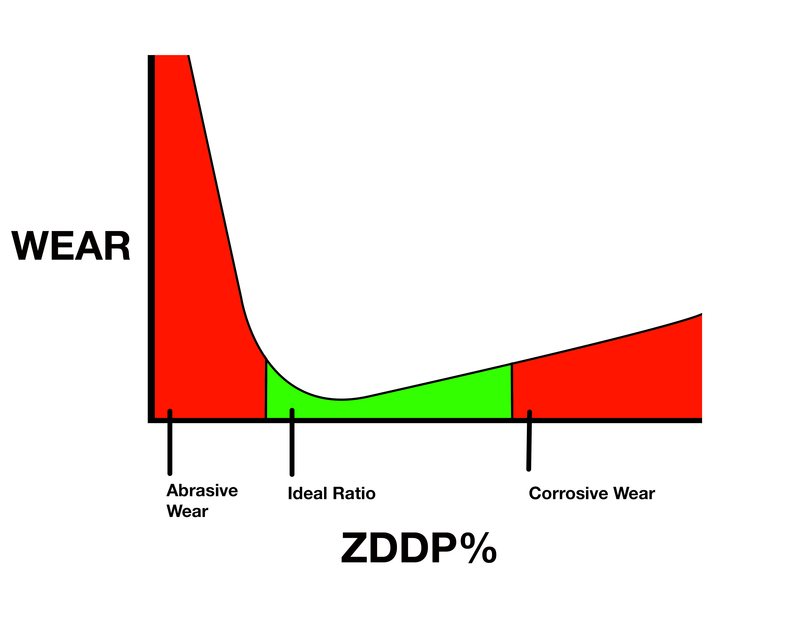 But, if you add the correct amount of ZDDP to an oil, you combat abrasive wear and very little wear happens. All good.So, if one is good, two must be better right? Wrong. If you have too much ZDDP, you start to see corrosive wear and cause another problem. Adding an excess causes the oil to become acidic, and before you know, you’re wearing cams, bearings and bushings because of too much ZDDP. The R&D department at Driven are dedicated to ensuring their oil has the correct amount of ZDDP to your application. It’s part of the whole ethos at Driven that the oil is designed with the engine in mind, rather than conforming to regular road oil standards or by just blending in additives without testing them in real race applications.